On Wednesday 25 April from 2pm-6pm I will be in the Blue Mountains to launch Australian Modern. This is a combined event which will also be celebrating the 50th Anniversary of the Beachcomber house, designed by architect Nino Sydney. But wait there’s more! It will also be the official launch of a new website devoted to the history and research of the Beachcomber. If you would like to attend this special event you will need to email Billy your RSVP E: pflamingo@bigpond.com The added bonus is that this will all take place at an actual Beachcomber in Faulconbridge, it’s also a public holiday, so go for a drive in the Blue mountains and I’ll see you there. The following evening, Thursday 26 April from 6pm-8pm, I will be the Sydney launch of Australian Modern at Object Gallery in Surry Hills. Please contact Object Gallery to enquire about booking, numbers are strictly limited and filling fast. 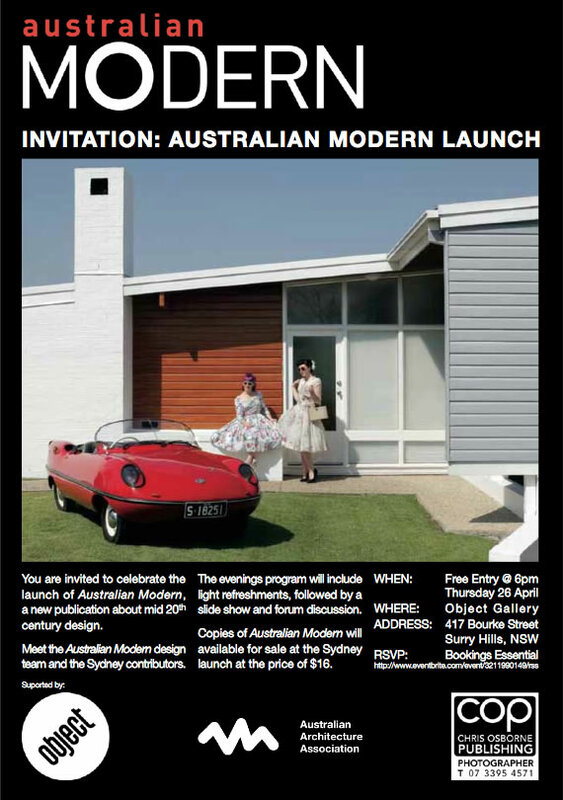 For all the Brisbane Modernists, when I return from the latest round of launch events I will start planning this years Modernist Architecture and Design (M.A.D) weekend. It looks like the last weekend of June will be the dates to keep free, more news later. Did you know that we also publish Brisbane Modern?